Today, Automatic Data Processing (ADP) announced an increase in its quarterly dividend to 23 cents per quarter from 18.5 cents per quarter in the same period last year. This represents a 24% increase in the dividend. What are the implications of the magnitude of this dividend rate increase? 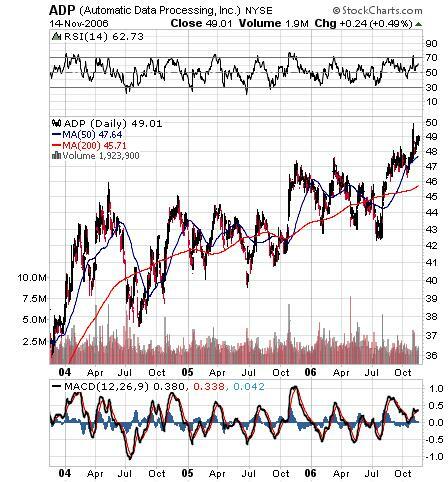 ADP is one of Standard and Poor's Dividend Aristocrats and ADP maintains an S&P Quality Ranking of A+. In the first quarter of the company's year ending June 2007, ADP reported earnings that were 21% higher versus the same quarter in the prior year. The first quarter earnings totaled 46 cents per share. The first quarter earnings were 3 cents higher than analyst estimates. The company's first quarter revenues increased 8%. Estimated earnings for ADP's upcoming year total $2.22. If one annualizes the new 23 cent quarterly dividend, the total estimated dividend for the next 12-months equals 92 cents. The projected payout ratio totals 41%. The payout ratio has trended higher from 25% in 2001 to the estimated 41% in the next 12-months. The question becomes, is the company expecting revenue and earnings to grow at a higher rate going forward. The company's revenues are estimated to grow 8% into the future while earnings are expected to grow 17% this year and 14% in the fiscal year ending 2008. An investor should maintain an eye on the company's earnings and revenue growth over the upcoming quarters. It is likely not feasible to maintain a YOY 24% increase in the annual dividend if revenues and earnings are growing at a slower rate than the dividend growth rate. The wild card in projecting the company's growth going forward is the company's recent announcement that it will spin-off its Brokerage and Services Group into a separate publicly traded company to its existing shareholders. ADP will receive $500-$700 million in dividend back to the company. In conclusion, the company's stock price has increased nicely over the last three years. Maybe this rate of dividend increase is a signal of stronger growth going forward.